Lawrence Golan conducts musicians at the U. of Denver, performing Puccini's "Suor Angelica." His ensemble gets only about $4,000 to rent and buy music each year. That means it can perform some copyrighted works but must rely on the public domain for about 80 percent of its repertoire. When Lawrence Golan picks up his baton here at the University of Denver, the musicians in his student orchestra see a genial conductor who corrects their mistakes without raising his voice in frustration. Yet Mr. Golan is frustrated, not with the musicians, but with a copyright law that does them harm. For 10 years, the music professor has been quietly waging a legal campaign to overturn the statute, which makes it impossibly expensive for smaller orchestras to play certain pieces of music. Now the case is heading to the U.S. Supreme Court. The high-stakes copyright showdown affects far more than sheet music. The outcome will touch a broad swath of academe for years to come, dictating what materials scholars can use in books and courses without jumping through legal hoops. The law Mr. Golan is trying to overturn has also hobbled libraries' efforts to digitize and share books, films, and music. The conductor's fight centers on the concept of the public domain, which scholars depend on for teaching and research. When a work enters the public domain, anyone can quote from it, copy it, share it, or republish it without seeking permission or paying royalties. The dispute that led to Golan v. Holder dates to 1994, when Congress passed a law that moved vast amounts of material from the public domain back behind the firewall of copyright protection. For conductors like Mr. Golan, that step limited access to canonical 20th-century Russian pieces that had been freely played for years. "It was a shocking change," Mr. Golan says over dinner at a tacos-and-margaritas dive near the University of Denver's mountain-framed campus. "You used to be able to buy Prokofiev, Shostakovich, Stravinsky. All of a sudden, on one day, you couldn't anymore." Other works once available but now restricted include books by H.G. Wells, Virginia Woolf, and C.S. Lewis; films by Alfred Hitchcock, Federico Fellini, and Jean Renoir; and artwork by M.C. Escher and Pablo Picasso. The U.S. Copyright Office estimated that the works qualifying for copyright restoration "probably number in the millions." Congress approved the recopyrighting, limited to foreign works, to align U.S. policy with an international copyright treaty. But the Golan plaintiffs—a group that includes educators, performers, and film archivists—argue that bigger principles are at stake. Does Congress have the constitutional right to remove works from the public domain? And if it does, what's stopping it from plucking out even more freely available works? "If you can't rely on the status of something in the public domain today—that is, if you never know whether Congress is going to act again and yank it out—you're going to be a lot more cautious about doing anything with these materials," says Mr. Golan's lawyer, Anthony Falzone, executive director of the Fair Use Project and a lecturer in law at Stanford Law School. "You really destroy the value and the usefulness of the public domain in a profound way if the rug can be pulled out from under you at any time." Before the rug was yanked out from under him, Mr. Golan had no experience as an activist. He still doesn't seem like one. 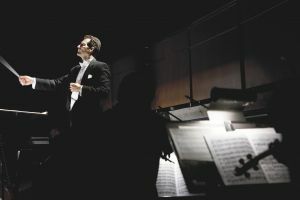 Outside the orchestra pit, the conductor could pass for an off-duty businessman: trim build, clean-cut dark hair, slacks, waist-length tan jacket. 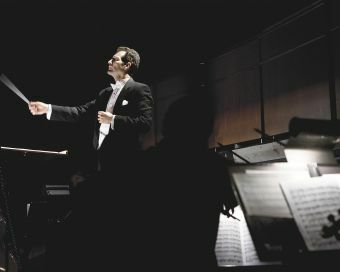 The tenured professor has taught conducting and led the 80-student Lamont Symphony Orchestra at this private university since 2001. Yet he has done little to publicize his cause on campus, at least judging from the reactions of others in the music school one recent evening as the halls buzzed with costumed nuns rehearsing Puccini's Suor Angelica. "No!" said one professor after hearing that Mr. Golan's case was going to Washington. "Are you making it up?" asked another. Mr. Golan keeps a low profile as a plaintiff because his life is about music, not litigation. "I would love to have my name go down in history like Arturo Toscanini, for being the greatest conductor of all time," he says. But because his quest for that glory coincides with a broad shift in the reach of copyright law, he has a better shot at going down in history as the capitalized name atop a Supreme Court opinion studied by future generations of law students. The son of a violinist in the Chicago Symphony Orchestra, Mr. Golan was just starting his own professional career when Congress passed the copyright restoration. The change was surprising from a philosophical point of view: Under copyright law, the Constitution grants authors a limited monopoly over their works as an incentive to promote creativity. Over the years, Congress has often delayed the passage of works into the public domain by lengthening the duration of copyright terms. But removing pieces already there was different, Mr. Golan's lawyers argue, a radical change in what one scholar describes as the basic "physics" of the public domain. That may sound abstract, but the impact on Mr. Golan was direct. When a work is in the public domain—that Puccini opera, say—an orchestra can buy the sheet music. Symphonies typically cost about $150. And the orchestra can keep those pages forever, preserving the instructions that librarians laboriously pencil into scores. But works under copyright are typically available only for rent. And the cost is significantly higher: about $600 for one performance. With the flip of a switch, the new law restored copyright to thousands of pieces. For big-city orchestras like the New York Philharmonic, that change is like a "mosquito bite," Mr. Golan says. But Mr. Golan's university ensemble gets only about $4,000 to rent and buy music each year. That means it can perform some copyrighted works but must rely on the public domain for about 80 percent of its repertoire. And $4,000 is relatively generous. Other colleges might have only $500 to spend on music. When the Conductors Guild surveyed its 1,600 members, 70 percent of respondents said they were now priced out of performing pieces previously in the public domain. Teaching suffers, too. Every year, for example, University of Denver students compete for the honor of playing a concerto, a piece in which the orchestra accompanies a solo instrument. But when a pianist wanted to audition with a piano concerto by Prokofiev, a Russian composer who died in 1953, Mr. Golan was forced to tell her no. "It's one that any aspiring pianist needs to learn, and to have the experience of actually playing it with orchestra is phenomenal," Mr. Golan says. But "we just didn't have the money in the orchestra budget to pay the rental price." The problem soon got worse. In 1998, after lobbying by entertainment groups like the Walt Disney Company, Congress passed another law, extending copyrights by 20 years. This Copyright Term Extension Act—mocked by critics as the Mickey Mouse Protection Act—meant that a work would not enter the public domain until up to 70 years after its creator's death. That legal one-two punch made it hard for Mr. Golan to play both foreign and American works, like Gershwin's Rhapsody in Blue. In response to those changes, reform-minded academics at top law schools fought back with multiple lawsuits challenging the constitutionality of the statutes. The conductor's tale made him an ideal poster child for their war to protect the public domain. Reformers suffered a defeat in 2003, when the Supreme Court rejected an online book publisher's challenge of the 20-year extension. In that case, Eldred v. Ashcroft, the court found the change acceptable in part because it had not "altered the traditional contours of copyright protection." Think of the Golan case as "Eldred, the Sequel." Only this time the question isn't whether Congress can delay works from entering the public domain. It's whether removing works already there is a "bright line" Congress can't cross. If that bright line dims, scholars and librarians will have problems. To understand why, consider the copyright confusion faced by Elizabeth Townsend-Gard. Ms. Townsend-Gard is an associate professor at Tulane University Law School. As a graduate student in the 1990s, she studied history at the University of California at Los Angeles. Her dissertation was a biography of Vera Brittain, a British author known for her World War I autobiography, Testament of Youth. Ms. Townsend-Gard mined letters, diaries, photos, and other texts for her research. But she worried about getting permission to publish materials she needed, because Ms. Brittain's literary executor, too, was writing a biography of the author. In 1996 the ground shifted under Ms. Townsend-Gard's feet. At the outset of her research, almost all the works she needed had been in the public domain. When she finished, because of the restoration now under attack by Mr. Golan, almost all those works were under copyright. She ultimately diversified her project so that it became a comparative biography of many subjects rather than just one. But she also grew fascinated with the copyright complexities surrounding the daily work of historians. Ms. Townsend-Gard ended up going to law school after finishing her Ph.D., and invented a software tool, called the Durationator, designed to tell users the copyright status of any work. The market of scholars who might need that tool is large. The law at stake in Golan alone potentially affects anyone studying works created or published by non-U.S. authors or publishers from 1923 to 1989. Most of those materials were in the public domain before. Now they are covered by a complicated copyright statute, says Ms. Townsend-Gard. "For people who work on the 20th century, it's fairly horrible," she says. Now pull back from the view of an individual scholar, and imagine you are working on one of the numerous projects to make millions of digital books available online. Libraries, archives, Google: Copyright restoration has big consequences for their digitization efforts. Most of those ventures will not publish the full texts of works online unless they are clearly in the public domain in the United States. But when it comes to a foreign book, figuring out its copyright status can require a mammoth investigation. That's because a work must have been under copyright in its home country to qualify for restoration in the United States, says Kenneth D. Crews, director of the copyright advisory office at Columbia University Libraries. So, for example, when Columbia considers digitizing a rare trove of Chinese books, including many from the 1920s and 1930s of great interest to scholars, its staff must grasp the legal nuances of a country that has gone through a revolution—and a transformation of copyright law—since the books were published. Or must try to, anyway. And if the law is unclear, the university must decide whether digitization is worth risking a potentially expensive lawsuit should a rights-holder turn up later. "It's deterring digitization on anything foreign," Ms. Townsend-Gard says, "because people can't figure it out." The U.S. Court of Appeals for the 10th Circuit took a different view. In a 2010 ruling backing the government, it stressed the argument that recopyrighting foreign works that had fallen into our public domain was crucial to protecting American authors' interests abroad. Our restoration of those copyrights could drive other countries to grant retroactive copyrights to contemporary American works that had fallen into their public domains. And big money is at stake. The court quoted Congressional testimony from the mid-1990s in which a group representing publishers, record companies, and other copyright-based industries estimated that billions were being lost each year because foreign countries were failing to provide copyright protections to U.S.-originated works. The recording industry told lawmakers that there were "vastly more U.S. works currently unprotected in foreign markets than foreign ones here." The government, in its Supreme Court brief, pointed out that the copyright restorations were limited in scope. They applied to foreign works whose creators weren't familiar with U.S. copyright procedures, for example. Other works restored were previously ineligible for protection. The Supreme Court is expected to decide the case during the term that begins in October. Mr. Golan hopes to be in Washington to watch. Unless, that is, he has a concert to conduct. If we subtract the emotion out of techie internet proponents---all their whines and tears and pleas and pleads and ple........., if we subtract out as well the emotion from big media thief corporations wanting to charge HUGE fees for CD format replacing record formats and getting away with it--------if we dis-authorize de-mystify BOTH these whiner groups----------we are left with SHEER LAZINESS. I didn't know the Internet was run by Spidermen. And...silly me....I thought the primary mission of copyrights was to promote the progress of science and the useful arts.....the founding fathers must actually have meant that the primary mission of copyrights is to incentivize authors by letting them hold onto their works so no one can use them in their, their children's, their grandchildren's, their great-grandchildren's, and their great-great-grandchildren's lifetimes in order to stagnate the progress of science and the useful arts. I must have misread the U.S. Constitution. Yes. And it was to incentivize creators to create b/c they could be reasonably assured that if they created something useful, they, or their duly authorized agents, could sell it with something like monopoly privilege for a limited amount of time. To make it freely available for anyone to copy and sell for themselves immediately was not the aim, as some would suppose. A solution to this moving forward for those really interested in pushing out their creative work for the enjoyment and use of others without much regard for making money from it is Creative Commons licensing. That corporate owners of creative products desired to extend their monopoly privilege is not particularly surprising, given the potential longevity of a corporation (now more and more understood to have the same rights as an individual). It is somewhat indicative, I think, of the corporations inability to continue to be creative...and thus the need to rest on the laurels and marketabilty of the creativity of the human founders now mouldering in the grave. You touch on some interesting issues...first is the individual copyright vs the "corporate" copyright. 30 or 50 years is plenty of time for an individual to enjoy the fruits of their creative labor while covered by copyright law. The extension of this to 70 years AFTER DEATH is just silly. At that point, it's not about the author of the materials benefiting from a copyright at all. The real issue driving the never ending copyright extensions is not individual copyright liberties but the corporate copyright. And underlying that fight is the fact that under US law, corporations are essentially treated as individuals. Since corporations have the possibility (at least) of existing permanently...in this age of protecting all revenue streams, copyrights are an easy and logical target. The question is...when is it enough? When does copyright law move from protecting the rights of the creator to stultifying creativity? Will the fight only end when copyrights become permanent? Talk about chilling...most of the courses I took in college relied in part on public domain materials...and even then course packets would run $100 and more. If every article published is under copyright and taken out of the public domain, many of those courses could not have even been taught...and that is a serious tragedy. EDIT: In reply to electronicmuse below, I reiterate the words public domain -- i.e. not under current copyright OR granted permission to print usually through journals or directly from the authors. These were not pirated materials. The result of the Kinko's lawsuit was that these materials were no longer printed for us but put on reserve at the library for us to copy at our own leisure. The net result was the same (course packet of copied materials) although the school library's copiers sure took a beating and I had a lot less free time at the start of the semester. Those "course packets" were deemed illegal in an action against one of the largest photocopy services in the USA. It's for CERTAIN that none of the authors enjoyed any of that hundred dollars, and that is the point! I'm sorry, but I don't follow. How is it that no one can use a work under copyright? I have no problem going to the local bookstore and PURCHASING a copyrighted work to read, or to the music store and PURCHASING copyrighted sheet music. The issue is two-fold; one is the question concerning works in the public domain being moved back into copyright, thereby changing the rules of the game; second is the costs associated with performing copyrighted material, especially for profit. In the former, my suspicion is that there will possibly be some grandfathering of PD works; failing that, in the latter case, copyright holders CAN (and often do) suspend fees for works used for educational purposes and not for profit. Should be interesting to see how this plays out. In fact, our laws are very much juried (pun intended) to make certain that money earned in business ventures passes to the descendants of the original "tycoons." Why not the descendants of creative people? There is no constitutional right to purloin the intellectual property of another. And, was patent law in the Constitution?????!!!! Worse, it adds confusion to even equate patent with copyright "missions," as per the framers of those respective sets of laws. Indeed, patents were brought about for the express purpose of allowing companies to retain proprietary rights, while at the same time revealing certain "trade secrets" and/or "state of the art" openly. And this makes great sense, as it definitely advances "the progress of science and the useful arts," as you correctly point out. However, there are no trade secrets, nor blueprints upon which one might build, in novels, songs, etc. and it is telling that we have separate patent and copyright laws. The intentions for patent and copyright law are very different, and you've mixed your metaphor here. The USSR signed the applicable international copyright agreement(s) in the summer of 1972. How frustrating to have to deal with libraries that refuse to lend through Inter-Library Loan or make copies of works published in the 1920s and 1930s using copyright as the reason. I can understand the unwillingness to lend the books: many books published in the USSR at the time will now disintegrate in one's hands. Refusal to copy is pig-headed, but like a telegraph pole, one cannot jump over it, but one an go around it. Fortunately there are British and continental libraries that are willing to copy such books. Here the obstacle is the price. Golan is screwed. The Supreme Court doesn't care about the rights of men. They have become fawning sycophants of the state. There is too much money pushing on the Supreme Court. They will yield toward money and power instead of standing up for the rights of citizens. Golan is screwed. Not sycophants of the state, but of corporations, specifically the large ones that own us. We are all of us being made into serfs. It formerly was easy: copyright ran out originally in the US after 14 years, with right of renewal for an additional 14 years. Gradually this modest time period was extended. Until rather recently, copyright was limited to 70 years. This made it easy to identify public domain works: anything over 70 years. The Congress, under lobbying by Disney and other publishers, made a very complex rule, supposedly designed to favor heirs of authors who died young, or whose work only became popular after many years. Many tears were shed for the plight of the author's poor descendants. Now it is plain impossible to tell whether a work is still in copyright or not. By contrast, patents last (in the US) only for 17 years, with a possible renewal for another 17. There are many inventors who get virtually nothing for their patents, because they were "ahead of their time." Apparently, they are not as worthy of sympathy as are artists, writers, and publishing conglomerates. The internationalization of copyright rules has made matters much worse, as countries try to coördinate their own policies with the quite irrational standards of the Bern Convention. Now it is not just a national problem, but an international fiasco, which means that it is apparently totally beyond reform. The best, and perhaps the only solution would be for the US to drop out of the Bern Convention, and go back to a reasonable, uniform term for copyright, not dependent on the lifespan of the holder or the genealogy of descendants. The public would have to understand the issue, and resist the emotional propaganda of the publishing industry, with all the sob stories about starving writers. I very much doubt that an electorate which is unable to have their representatives effect a balanced budget, would ever be able to attain a sensible policy for copyrights. It is an almost fixed rule of law that regulation grows ever more complicated, and is very seldom reformed by simplification, as valuable as that might be. In fact, Benjamin F. Miessner, an inventor (electric piano, solution to "hum" problem in early AC radios, and many others), fought for what he considered to be "equity" between patent and copyright periods. He lost. Interesting case. This outcome will impact many creative people. In the Lessig case, the Supreme Court said that they have no jurisdiction over copyright, which is solely determined by Congress (and does not bode well for the Golan case) . Unfortunately the authors of the Constitution apparently did not think it possible that all members of Congress could be bought and convinced to keep on extending copyright. With the Supreme Court's decision, there is nothing to prevent Congress from extending copyright to ridiculous lengths, such as 500 years - and certainly Congress by itself does not have the ability to reasonably regulate itself. And yet the Consitution guarantees the public domain - but what party is supporting the public domain? If there was ever a convincing argument for increasing piracy, this is it. The way I would put it is that it is time for those in higher education to engage publicly in civil disobedience when it comes to allowing these entitlements of monopoly granted to commercial publishers by the federal government to hinder the social good we can accomplish as educators. Copyright is out of control, and that can't be changed by people who won't raise a ruckus. I suggest you be careful taking this advice. The "cost" of some kinds of civil disobedience, e.g. in which I engaged in the 'sixties, was a night in jail, or possibly even a knot on the head. If you go up against the powerful interests who support copyright, you might wind up "owing" hundreds of thousands of dollars as the result of legal action. The precendent has certainly been set. Good for Golan. At least he's trying to change something instead of just complaining or even worse, paying the higher prices and doing nothing. I also think he's on to something here. Once something enters the public domain, it's the property of the people. Imagine that the government took a physical piece of property given to the public by a corporation or family, and retroactively restored those property rights to the corporation or family. For example, the land on which many universities sit. Then the property owner could charge the university to use the land. Of course, most people would be outraged. What's the difference between removing and then restoring intellectual property? The rights of the many are still subverted in favor of the rights of the few. respectively, or to the people." How often the people are forgotten. Once something enters the public domain, isn't use of that thing a right reserved to the people? I believe this is the intention behind the 10th Amendment. I think there are several sound legal arguments to be made and I look forward to following this case. Did you say something about government taking property from families and handing it over to corporate interests? Good point. But in "eminent domain" arguments, there needs to be some compelling public interest in the project for which eminent domain is exercised. I cannot see how any compelling public interest is served by exercising "eminent domain" over intellectual property. But you do present a great example of case law when public interest was imaginatively exaggerated for private benefit. It doesn't make it right, nor does it mean that the court won't see it differently. There is an irony in extending the copyright period to protect Disney. Would Walt Disney have been able to create the vast entertainment empire if works such as Snow White, Pinochio, Cinderella, and Little Mermaid were not in the public domain? Disney clearly benefited by using the works of others but does not want others to access their work. The Constitution authorizes copyright protection to give an incentive for creative effort. But how does extending the copyright on an existing work give an incentive to a dead author? Our economic system depends on the sanctity of the contract. At the time a new work is created, the author or composer knows the terms and agrees to create the work. There is essentially a contract between the creator and the public. Going back and extending the copyright terms is essentially revising the contract unilaterally. The Constitution forbids Congress from revising contracts. But the bright side is that retroactively giving copyright protection to works in the public domain may hold the key to resolving the U.S. debt ceiling crisis. Congress could retroactively extend copyright protection to the U.S. Constitution. Anyone citing an article or clause would have to pay a royalty of, say, 99 cents. It could be administered by Apple through iTunes. This site alone could generate enough revenue to keep the government open for quite a while. In the same way that our laws provide that money will pass to heirs of business tycoons, why should not the heir of authors and composers enjoy the same rights? After all, aren't they just "dead tycoons," in the same way that you allude to a "dead author?" Different situation. Indeed, the dead tycoon does not earn money after he is room temperature. He can pass on savings to his heirs, but so can an author, or anyone else. There is nothing stopping the artist from buying stock in the tycoon’s company; nor stopping the tycoon from buying the artist’s works. The original idea of copyrights and patents was to encourage creativity which after a (relatively short) time would become generally available, increasing the wealth, prosperity, and cultural level of the society. Even a tycoon’s work is difficult to contain indefinitely, because there will be imitators of his successful policies, and entrepreneurs who will originate alternative products and services. History gives good examples of furious competition, particularly in new, developing technology. The time-limit on patents gives incentives for licensing technology, in order to maximize the value of the patent to the holder; so even fierce competitors trade these rights.In the early days of radio, there were hundreds of manufacturers; and there must have been several hundred automobile brands in the United States in the early days. Both involved numerous patents.Without a patent system, it is hard to see how developers of new drugs could recoup their investments. The fact that the patents have an expiration keeps the companies looking for new discoveries, and also usually ensures that the prices of the drugs will fall over time. Falling prices are a good thing, because they mean that people can get more for their earnings. It is an obvious (but overlooked) demonstration casting doubt on Keynesian theory, that the most progressive industries usually have sharply falling prices, which seem not to discourage the pioneering companies in the least. The first hard-drive I had cost $350 for 20 MB of storage. For that much money (which is now inflated!) I can today buy more than 4 TB of hard-drive capacity. It means that to buy that 4 TB at the first price-rate, I would have to spend $70,000,000 (or the equivalent of about 160 houses such as the one in which I now reside)!! Each hard-drive rests on numerous patents, some current, demonstrating that the patent system does not seem to have choked development. To get back to copyright: it may be that an overly long copyright validity may actually be bad for the author’s readership. In order for an author still to be read after many decades, his work must not only be good, but his books should be accessible, and if they are in public domain they are much more likely then to be available, especially in the digital world, where printing and binding and shipping costs hardly count. There can be no doubt that cheap books are a benefit to society. Surely the works of past authors are an inspiration and stimulus to those of the modern day; and one would suppose that this stimulus would be of at least as much importance for musical works, which one would like to hear or perform. Creativity thrives on competition, on the inspiration of others, and on emulation of good models. Specious argument, your last. Books can just as easily be "accessible" under copyright as in the Public Domain. Also, your assertion that creativity thrives on competition is dubious at best. Also, it is not true that tycoons cease earning when they fall to "room temperature," as you say. Their companies are often passed along to heirs, just like more-liquid assets. You still haven't answered why this should not be the same for descendants of "creative" people. The District Court got it right in Golan, and the 10th should be reversed. But for Article I Section 8, copyright laws would be unconstitutional. Congress dramatically altered the established contours of copyright law, making it ripe for courts to examine whether Congress overstepped this specific authority to suppress speech without abridging the freedom of speech guaranteed by the First Amendment. In my view, this Act is not even rationally related to the only purpose for copyright protection set forth in the Constitution and is, therefore, unconstitutional even without the First Amendment. But the standard here should be an even higher level of scrutiny, particularly since the impact is primarily to enrich for profit corporations and has no effect on the promotion of progress and useful arts. Rather than serving to encourage authors to create more, it benefits the corporations managing the creations of the dead, and creates economic and legal barriers to living authors. Stealing music, or a novel, does not constitute free speech! It isn't stealing. Copying may be illegal, but it isn't stealing, any more than speeding is murder. Though speeding can result in death, it is a distinct crime from murder. We've covered this point about copying many times, so many that it is clear people who argue in this vein are not arguing sincerely. You are trying to prejudice your case with inflammatory rhetoric. What do you think, did that scurvy verbal trickery work? Did it convince anyone? No. At most, it perpetuated a deliberate confusion. That's not a solid foundation for a good argument. An essential step towards an understanding is that you quit using this tired old cheap pejorative, and admit that COPYING IS NOT STEALING. docbnj, I agree with you on the current copyright situation. Regarding patent terms, the law changed a while back and patent protection is now 20 years from filing with patent term extensions rarely granted. says, "because people can't figure it out." So, here's an idea. I am sure the Chinese find it hard to figure out US copyright laws too, and that deters them digitizing foreign, to them, stuff. So, why not let the Chinese produce digitized copies of Windows 7; and in return the US can produce digitized copies of Chinese literature. Deal ? Or just arrogant racism ? I agree that, to put it somewhat more politely than some others, Golan has had it. So have many of the rest of us. The Supremes, as currently constituted, are in business to protect the doings of business, no matter how egregious. And if it at the same time, a blow can be struck against education—and particularly arts education which everyone knows to be subversive—why how much nicer! But, on the other side, we have to acknowledge that the Supremes can also be hard to predict; sometimes they step out of character and do something right. I need to reply to myself, that is to add something, This entire discussion could be greatly leavened by some yeast from history. In the first half of the 18th century, the great German music theorist, Johann Mattheson, remarked that it was all right to borrow if one returned the material with interest; in other words, if one used material that today would be considered simply swiped in a new piece with some added interest. Where, dear music lovers, would (e.g.) Handel have been in today's world? At the least in jail for (justified) contempt of court. Well, gee, we're not talking about a bunch of Handels and Bachs out there, "quoting" from a previous generation of composers, are we? We're talking about people who think of intellectual property as "free," for no more reason than they CAN steal it with impunity online! Also, by the way, there indeed is a great deal of "sampling" (borrowing sounds rather than musical themes) in the current milieu of pop music. But, the party who "quotes" has to pay. And it has been possible to "cover" a song with a new rendition for a long time. But again, the party who "covers" has to pay! And, the fees are not onerous . . . I feel certain that the flow of music history will continue without serious impediments if we enforce copyright laws! We are a not-for-profit organization that was established in 1983 for the purpose of collecting, preserving and sharing written music and to promote music education. As a part of our organization we lend out over 250,000 individual titles, with a total of a million pieces of sheet music that we lend out to our members. Check us out on line at www.bagaducemusic.org Sadly we can't help Mr.Golan as we do not carry symphonies, but I'm sure The American Symphony Orchestra League can. After a professional study done last year, we have been deemed 47% rare and hope to keep it that way so that future generations can benefit from our collection. Thomas Jefferson figured 17 years was about the right length of time, and in his day patents were intended for individuals, not corporations--which were not treated as persons until 1886.
a. Infringement of the performance right only takes place if the performance is public. See 17 U.S.C. 106(5). Therefore there is no restriction on performing a copyrighted work in an audition, assuming that is not open to the public. b. The Copyright Act contains a broad exemption (Section 110) for the performance or display of copyrighted works "by instrucotrs or pupils in the course of face-to-face teaching activities of a nonprofit educational institution, in a classroom or similar place devoted to instruction," (such as an auditorium, if it is used for teaching). The TEACH Act provides a similar exemption for distance education. This is NOT part of the fair-use exemption; it is better than that. It is carte blanche to perform the entire copyrighted work in a qualifying situation. The only constraint is that this must be "teaching," not simply a free-standing performance. But "teaching" is not defined, so one could argue that performance by students who are being evaluated by the instructor is part of the teaching process. I wrote a stage play about Christopher Marlowe and his day job as a spy for the Crown. The first reading was in 1983 and it was produced in Equity Waiver by the Shakespeare Society of America, Inc in 1988. Last year, some 22 years later I was able to get a film deal on this play, which had not been produced since and it will be produced later this year or early next. Because of this the original play has been republished on Amazon Kindle and B&N Nook and is now available at a reasonable price (the original edition was priced as high as $140.00 per copy). The first draft screenplay will be available as large format trade paperback next month. Without the protection provided by my copyright registration none of the recent deals would have happened. There would be no incentive to rescue what had become, even under copyright, an orphan work. The original term envisioned by Jefferson would have expired. There would be no incentive for me to devote time I could use creating new work to maintain and promote the older work. Creating historical fiction is time and research intensive. Writing the play was the least part of the process. The original inspiration for the first copyright law; The Statue of Anne, in 1710 was the pernicious copying of creative work without permission by others. Immanuel Kant complained about this in "The Science of Right" in 1804. So the problem is not new and the debate is not new. Behind the debate is the desire of some people to use creative work without paying a fair price for the use. It's as simple as that. Money. Like every other creator I need to get paid for what I do. Otherwise how am I to live? There is nothing wrong with copyright as such or with copyright law. What is at issue in this specific case is that works previously in the public domain were given copyright protection (and very long protection at that). It should not be possible for a work in the public domain to be given further copyright protection. Also, the length of copyright applied to works these days is far too long. Even a 30 year or 50 year flat copyright term would be vastly better than the mess we have now whilst still allowing situations like yours. Why Are They Full of It? Lawrence Golan, music teacher and conductor, has a case whose outcome could affect access to many books and films, as well as to some composers' scores. Confronted with the murky copyright status of many works, academic archives are playing it safe and limiting online access to scholars.